Here we go again! It’s the holidays! 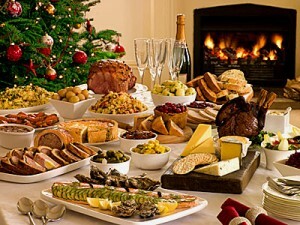 Dinners, parties,wine, chocolate, cookies, candy, pastries and the list goes on! If your mouth is watering right now with the thoughts of cheating on your diet then this post is for you! Remind yourself why you are doing this in the first place. Write it down. Try on your goal dress or pin up your old college ball pics. Getting fit is about looking and feeling your best. Is it a six pack you’re after, are you trying to improve your health markers like blood pressure or cholesterol. Do you want more energy to play with your kids, look good in a bikini or finally have the confidence to go shopping and love what you try on? Stirring up all these passionate reasons will give you the focus to maintain your workout schedule and make excellent food choices. You know when your celebrations are scheduled. You also know that there are going to be tasty delights circulating around the office waiting to hijack your willpower and drown you in sugary calories. So for the next two weeks make sure you are keeping you calories in check by substituting your heavier breads, pastas and rice with a variety of veggies. Aim for 5 servings a day. Remember vegetable are carbs too. Anything you can eat in a sandwich you can have in a salad. Have 1 big salad a day. This substation will reduce your calories without you feeling hungry all the time and this way if you do end up having some treats you will balance out your net calorie intake. Mini workouts wake up your metabolism and give you doses of happy hormones that can keep you feeling great for hours after your workout. But perhaps the biggest value occurs on a much deeper physiological level. The trick is to get in a workout before you eat a big meal. This signals your body to devote those post workout calories to restoring energy balance vs. fat storage. For the biggest metabolic boost do combination exercises that use more than one muscle at once and train in a circuit. Aim for 15-20 minutes high intensity! Continue to drink lots of water throughout the day. The excess sodium from preserved foods and snacks can overload your kidneys and cause you to retain water and feel dehydrated. If this happens the last thing you’ll want to do is work out and the first thing you’ll want to do is reach for a sugary carb loaded pick me up. Avoid this cycle at all costs. Flush your body out with water to keep from retaining water and feeling dehydrated and fatigued. Start with 2 litres for women and 3 for men. If it’s a workout day you’ll need more. At the end of the day remember that its not what you eat from Christmas to New Years, its what you eat from New Years to Christmas so aim to eat well 90% of the time and you’ll have no problems keeping your body in check when it counts. P.S. Special thanks to Elizabeth for some great ideas for this post!